Early childhood educational (ECE) facilities overwhelmingly impact their occupants; the design of these facilities, therefore, cannot be understated as young children often spend up to 12,500 hours of their juvenile lives in child development centers (Day, 1983; Vaughan, 2007). An analysis of the literature and research on ECE reveals differences in the layout of preschool, kindergarten, and first grade classrooms. This paper demonstrates how the design of the physical environment should evolve to respond to the developmental needs of preschool, kindergarten, and first grade children. Both literature and research on ECE environments have been used to create a schematic analysis that informs designers of particular design implications used to create a physical space successful in fostering and enhancing positive child development and effective learning. We have a long understanding that, more than any other building type, early childhood educational (ECE) facilities have a profound impact on their occupants (Day, 1983; Olds, 2001). A universal and necessary development component, early childhood centers, preschools, kindergartens and first grade classrooms have become commonplace for millions of young children ages three to seven years old. According to the National Clearinghouse for Educational Facility Planners (2000), more than thirty percent of today’s children under the age of three and almost fifty percent of children between the ages of three and five attend an early childhood center or educational facility for some part of their day. This large increase results from the influx of women in the workforce, the intensification of longer workweeks, and educational research that supports the importance of early childhood education. All of these factors have contributed to the rise of early childhood centers and facilities throughout the United States (National, 2000). Vaughan (2007) stated that as many as seven out of ten American children under the age of six participate in some form of care and/or education outside the home; these children spend up to 12,500 hours in a child development center prior to entering the first grade. The design of these facilities, therefore, cannot be understated. The design and maintenance of a child’s physical educational setting should support high-quality activities as well as allow for optimal use that fosters quality learning. It is through new research in educational settings, new technology, and the consideration of the child in general that can aid designers in creating the most innovative, useful, and effective environment for the world’s children to develop, adapt, and learn. Children are exceedingly sensitive to space; they respond to many kinds: big spaces, open spaces, small spaces, cozy spaces, and especially hidden private spaces. The right kind of space creates activity, imagination, and educational opportunities (David & Wright, 1974). Research documents that children remember places far better than they remember people and things; thus, every design detail within a space is essential (Olds, 2001). Designers play an integral role in the development of successful ECE facilities that foster learning and stimulate their most important user—the child. However, designers often face many problems in creating successful learning environments that support ECE. Problems within these spaces include the overlapping environmental needs of both the children and adult inhabitants, and the significance of the child in general often gets lost or overlooked in design considerations. 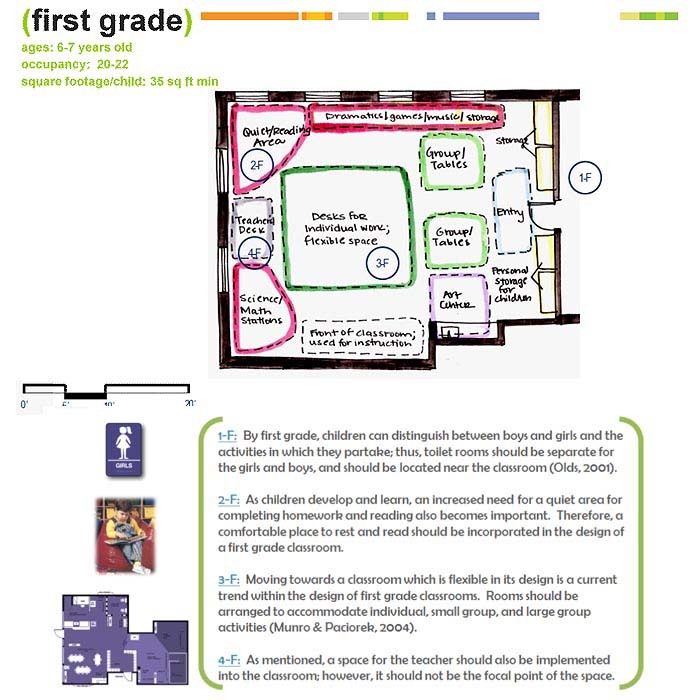 Elementary school archetype, especially the layout of the first grade classroom, is frequently used as a model or guide for the design of preschool and kindergarten classrooms. This practice, however, regularly ignores the needs of the child and limits the early childhood educator’s ability in delivering the curriculum effectively (Council, 2006). With such developmental and physical differences between ECE children and first grade children, the archetype of first grade classrooms simply cannot be used as a template for the archetype of ECE environments. This literature review was conducted focusing on the developmental differences between children ages three to seven years old to find differences between spatial needs, design implications, and environmental stipulations of preschool, kindergarten, and first grade classrooms. 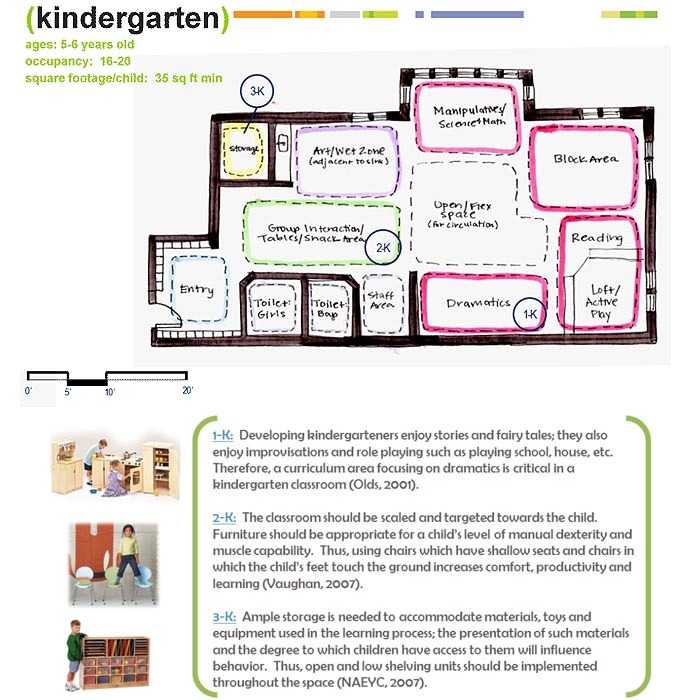 Specific environmental design features conducive to the successful learning of early childhood education children were then highlighted and a schematic prototype of each classroom setting—preschool, kindergarten, and first grade—is presented to demonstrate these differences. The following information supports these findings and exemplifies the most successful ECE environments that conclude to be nurturing, stimulating, and beneficial to preschoolers, kindergarteners, and first grade children. The needs of a child are distinctive to his/her age, size, ability, and the process and manner in which he/she learns. Early childhood educators and neurologists agree that the first eight years in a child’s life are a critical time for brain development (Exelby & Isbell, 2001). The first three to five years in a child’s life are vital in the development of language, attention span, social skills, and problem-solving capabilities (National, 2000). For example, three-, four- and five-year-olds begin distinctly developing their gross motor skills; they can catch a ball, run, hop, and climb. As Table 1 indicates, fine motor skills and language also increase as these children can now use scissors, draw, paint, write, complete puzzles, speak in ten-word sentences, listen, and retell a story. Cognition also improves drastically as preschool aged children begin to count and solve simple problems (Crawford, 2001). These children are curious and interested in learning about their world; they have many creative ideas and approaches, and they are capable of making decisions and selecting materials to implement projects (Exelby & Isbell, 2001). Preschoolers are active and eager learners; they are constantly exploring, manipulating, and experimenting. Preschoolers rely heavily on their senses, are beginning to use symbols and reason, and have begun to think abstractly. An increase in physical coordination and strength allows preschoolers to handle new materials, build creatively, and initiate new activities (Munro & Paciorek, 2004). Table 1. Growth and development of children ages three to seven. Kindergarteners continue to develop their gross motor skills and are very dexterous on their feet. Cognitively, these children begin to recognize differences, distinguish spatial relationships, and can think in terms of symbols. Group play also becomes very important in the successful development of children ages five to six. First grade children continue developing their gross motor skills, however, and they also begin to develop and improve their small muscle motor skills. First graders or children ages six to seven learn how to lace their shoes, use a knife, and can cross the street safely. First graders can also make comparisons; they regard highly what others think about themselves, are able to separate fantasy from reality, and enjoy role playing and competitive games. Children of all ages learn by doing—play is the occupation of a child. Manipulating the design of the classroom to encourage play, which psychologist and educators believe to be a child’s primary avenue to learning, can yield high developmental dividends (Morrow, 1991). Thus, designing the educational setting that supports a playful environment is the formidable and arduous task presented to designers of ECE environments (Ruth, 2000). One extremely significant goal of early childhood education is the encouragement of development through discovery and creativity (Council, 2006). With differences in the developmental characteristics of children, the design of schools and the classroom needs to provide positive and enriching experiences in which children can move, explore, experiment, and discover for themselves. Children interpret the environment holistically and evaluate it for all the ways they can interact with it; they use the environment to aid their development and improve themselves (White, 2004). Research indicates that children have four major environmental needs within the classroom—movement, comfort, competence, and control (Olds, 2001). Children need to move within a safe and tolerable limit; they need moderate and varied levels of stimulation for all senses; they have a need for the feeling of success especially when negotiating and navigating the environment; and finally, they need to acquire increased levels of autonomy by making decisions on their own and exercising control (White, 2007; Council, 2006). The ECE classroom has evolved to accomplish these environmental needs over the last hundred years (Brewer, 2001). For example, in the 1900s classrooms were often rectangular in shape with chairs bolted firmly to the floor in straight rows. In the 1930s and 1950s classrooms were often square in shape with moveable chairs, the teacher’s desk was often in the back or corner of the room while in some cases may not have existed at all. These two scenarios, however, frequently resulted in an empty cognitive learner or caused the child to lose focus and concentration. An open classroom then evolved and was implemented during the 1970s. This classroom type, which continues to be used today, proved to produce a stimulus-seeking learner (Olds, 2001). The open classroom has moveable desks or tables, activity or curriculum areas, and allows flexibility, circulation, and a positive learning environment for all children. Spatial needs of the young learner are also distinct from the traditional elementary school student; classroom size is quite different from a typical elementary school or primary grade classroom. Kowalski’s study (1989) suggested a room of 1100 to 1300 square feet is needed for an effective preschool or kindergarten classroom holding approximately twenty-five students, as compared to the 800 to 1000 square feet needed for a primary school classroom. Current research continues to support these findings as all ECE classrooms housing preschoolers, kindergarteners, and first graders should allot between 42 to 50 square feet per child (National, 2000). The basic difference in overall square footage between these different types of classrooms is due to occupancy load standards. For example, it is encouraged that only fourteen to sixteen preschool children occupy a classroom at a time whereas sixteen to twenty kindergarteners can occupy the same space (Olds, 2001). 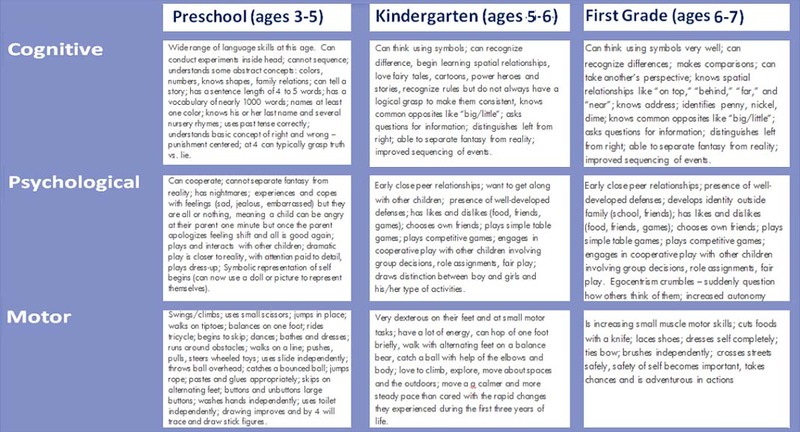 These design implications are also summarized in Table 2, which organizes research found in the previous literature review according to the various design elements and spatial requirements for each age group of children—preschool, kindergarten, and first grade. Also seen in Table 2 is the minimum requirement of usual space per child. According to the National Association for the Education of Young Children (NAEYC) Accreditation Criteria for Physical Environment Standards, a minimum of 35 square feet of usual space is required per child in each primary indoor activity area in preschool, kindergarten, and first grade classrooms. Though a standard of 35 feet per child has been established, this spatial requirement is only a minimum and refers only to the primary activity space; this does not include space for other necessary functions to take place in secondary and tertiary spaces such as corridors, toilet rooms, and additional storage (NAEYC, 2007). To gain a better perspective, 35 square feet is only a 5’x7’ volume—slightly twice than the average size of a playpen. This is hardly the free-range space preschoolers, kindergarteners, and first graders need to develop their gross motor skills, physical coordination, and autonomy (Olds, 2001). Therefore, because children learn in motion, 42 to 50 square feet per child is optimal. Learning is a physical activity; young children learn with their whole bodies (Carter & Curtis, 2003). Children need large spaces to jump, skip, move, and play. Table 2. 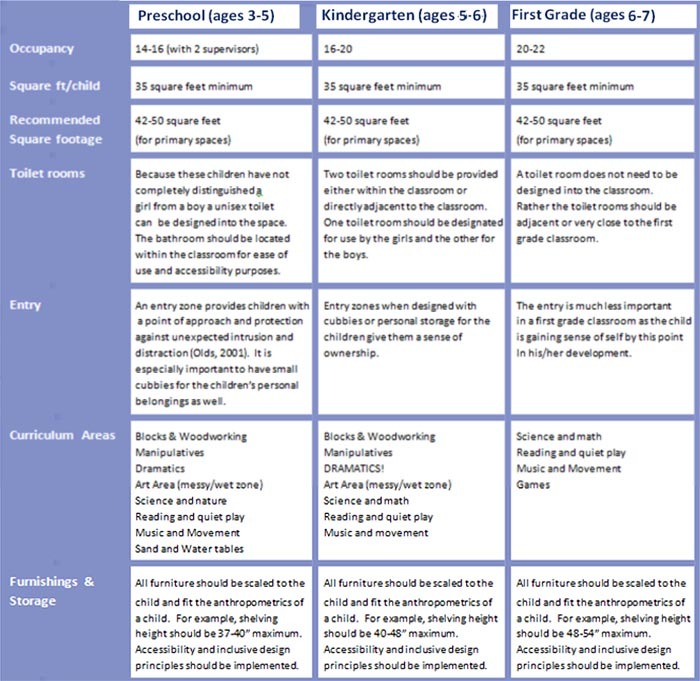 A comparison of environmental design issues in preschool, kindergarten and first grade classrooms. Besides square footage, there are important differences in the layouts of preschool, kindergarten, and first grade classrooms. Experts have identified several areas of development that are critical during the early years of children (Brewer, 2001). Developing interest areas, otherwise known as learning centers or curriculum areas, has become common in the design of early childhood education classrooms. The benefits of learning centers include the promotion of a child’s independence, choice making, acquisition of new skills, and increased autonomy. Curriculum areas also allow teachers to embed learning opportunities across a range of ability levels within any given learning center. Basic learning centers focus on areas of development such as logical thinking, language, and emotion. Early childhood classrooms often include areas for art, music, a library, listening and writing activities, blocks, dramatic play, science and discovery activities, mathematics and games, woodworking, sand and water tables, and quiet activities. These areas should reflect the children’s age, development, growing abilities, and changing interests; learning areas are not static (Brewer, 2001). Learning centers encourage children to work and learn at their own pace with materials that meet their individual needs and levels of development (Munro & Paciorek, 2004). For example, the block center develops motor coordination and creativity in building, allows for socio-dramatic play, encourages cooperative endeavors, and facilitates intuitive concrete learning of mathematic relations (Crawford, 2001). All early childhood educational settings ranging from a preschool/toddler classroom to a first grade classroom should have curriculum areas; the activities should meet the child’s developmental needs. Curriculum areas should be age and developmentally appropriate for children to engage in activities throughout the day. For example, a room focusing on the education of toddlers and preschoolers may be geared towards tuning the child’s gross-motor skills so activities that involve climbing, moving through, pushing, and/or pulling should be implemented throughout the space. A first grade classroom might focus on fine motor skills and include a large art center with activities geared towards finger painting and cutting materials with scissors (NAEYC, 2007). Learning centers can and should be changed throughout the curriculum to maintain stimulation (Grisham-Brown, Hemmeter & Pretti-Frontczak, 2005). Learning centers should be clearly defined; differ in size, shape, and location; and attend to traffic patterns. These areas should also be clearly visual to the teacher (Munro & Paciorek, 2004). Important aspects in the arrangement of these learning areas are reciprocity and adjacency. Learning areas should be arranged so reciprocity of activities between areas can occur and the materials in adjacent areas can be used productively in each area. For example, a sand table placed next to a paint station allows for the sand to be used in a painting activity. Another example is the placement of toy cars and trucks near the block center (Olds, 2001). The zoning of activity areas is also important; the location of the art center near a sink and the library away from water and paint is crucial for an effective classroom layout. Moving towards a classroom flexible in its design is a current trend within the design of early childhood educational facilities. Rooms should be arranged to accommodate individual, small group, and large group activities (Munro & Paciorek, 2004). Preschool children have a tendency to work and play in clusters or small groups fewer than five (Kruse & McGowan, 2004). Therefore, designating spaces for classroom work such as reading and writing should be implemented. Children in a preschool setting spend much time alone as well, either actively engaged or passively uninvolved; therefore, the need for small, quiet, and individual work spaces is essential (Day, 1983). Children’s play episodes and engagement with other children are also longer when they play in small spaces (Brewer, 2001). It is important for a classroom to have a high degree of spatial differentiation. Activity areas may be separated by physical objects such as moveable partitions and cabinets or intuitive visual cues. Using visual cues such as contrasting flooring materials, wall colors, and changes in lighting and ceiling or floor height also produces effective and appropriate spatial differentiation. Clear pathways and ample space for egress and circulation must be provided (Kruse & McGowan, 2004). Such distinct and well-defined boundaries and clear circulation paths support social interaction, encourage exploratory behavior, and prevent interruption of ongoing play (National, 2000). The early childhood classroom and its furnishings should be scaled and targeted towards the child. According to White (2004), research shows the more child-scaled the environmental space, the higher the quality and complexity of a child’s play will be and the longer he/she will be preoccupied in the play—thus the more he/she will learn. Child-sized environments increase concentration and interest (White, 2004). Selecting child-size furniture; varying ceiling heights; placing windows at a child’s eye-level; and mounting sinks, toilets, and water fountains at appropriate heights for children are just a few ways to effectively design an ECE classroom. Required by the National Association for the Education of Young Children (NAEYC) and the program’s accreditation criteria for the physical environment of early childhood educational settings, all spaces should include child-sized furniture appropriate to the child’s age and size. For example, it is required that each space must include one chair for each child over the age of one. Each chair must have a back and seating height that allows the child to sit with his or her feet on the floor or ground. Using furniture scaled specifically for children increases comfort, productivity, and learning. Using materials, furnishings, and architectural elements appropriate for a child’s level of manual dexterity, muscle capability, and level of intelligence is also essential to the successful design of early childhood centers and classrooms (Vaughan, 2007). Ergonomics is important to consider in a preschool and kindergarten setting as a designer should take into account children’s physical sizes and abilities such as height, grip, reach, and field of vision so tasks can be performed with minimum stress and maximum efficiency and safety. Thus, tables should be waist high to children, children’s feet should touch the ground when seated in a chair, and chairs should have shallow seats and slanted backs (Local, 2005). Tables at a height that allows a child to sit comfortably with the table between his or her underarm and waist are required to be present throughout the space according to the NAEYC (2007) as well. Storage, for both the child and the teacher, is an issue often overlooked when designing an educational space. Ample storage is needed to accommodate the increasing amount of equipment and materials used in instructional and extracurricular programs (Kowalski, 1989). The presentation of materials and the degree to which children have easy access to them will influence behavior. Open shelving rather than enclosed cabinets should be used as children have high visual-perceptual orientation; what they see is more attractive than what they are told might exist. Therefore, low shelves should be used instead of large bookshelves (Day, 1983). Materials should also be organized and uncluttered as children often pass by without notice if the activity area is disordered. A standard for NAEYC Accreditation also states that individual space should be provided for each child’s belongings. Cubbies, boxes, or crates should be provided to store a child’s personal items such as coats and backpacks as well as give the child a place that feels his/her own (NAEYC, 2007). Material selection within an early childhood classroom and facility is an important component of design. Materials need to be durable and easy to clean and maintain. Using materials and finishes that can be sanitized is extremely important as furniture and surfaces get extremely dirty very quickly (White, 2004). Institutional, unnatural finishes and textures should also be avoided. Rather, natural finishes emphasizing a “hand-made” appearance are suggested (Vaughan, 2007). Wall surfaces should have a smooth finish and be painted a low sheen. Toilet walls in particular should be impervious and easily cleanable as well. High gloss paint and/or ceramic tiles should be considered for areas at risk (Building, 2007). The acoustical environment should also be considered. Unlike adults, a child is cognitively unable to fill in the blanks if he/she cannot hear his/her teacher (Vaughan, 2007). Therefore, soft surfaces such as carpet, fabric and/or perforated ceiling tiles should be used within a classroom to reduce the noise level in a structure built of concrete blocks and tile flooring (Exelby & Isbell, 2001). Flooring materials should also be secured to keep staff and children from tripping and falling (NAEYC, 2007). Color enhances the visual experience. It has an emotional appeal and should be considered as well as material selection. In classrooms it is best to use deep and neutral tones. Color should also be used as a mechanism for wayfinding in facilities geared for the use by a child (White, 2004). Finally, materials and furnishing should age gracefully with use and be extremely resilient to uphold the wear and tear of a child. Children learn in motion and relate to the world through their bodies and senses (Olds, 2001). Therefore, designers cannot overlook nor underestimate the spatial requirements relevant to the successful development of a child. The schematics created in Figures 1, 2, and 3 reflect and support the basic design implications required to design a successful ECE environment. 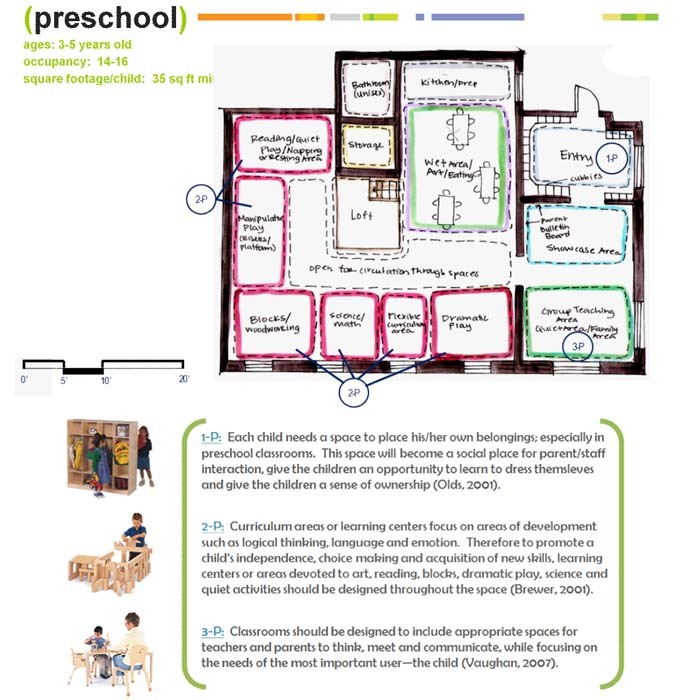 These prototypical floor plans graphically represent the space needed per child, the arrangement of curriculum areas, and other necessary design elements and solutions to create an environment suitable for the education of young children as discussed previously. Through this study, it has been found that though a standard of 35 feet per child has been established, this minimum spatial requirement refers only to the primary activity space; it does not include space for other necessary functions to take place in secondary and tertiary spaces. To gain a better perspective again, 35 square feet is only a 5’x7’ volume; only a little twice than the average size of a playpen. This is hardly enough space for preschool, kindergarten and first grade age children to develop their gross motor skills, physical coordination and autonomy. Finally, children are taught through creative play, social contacts, and natural expression. A designer can create a physical space which is highly successful in fostering early childhood development and learning by focusing on the arrangement of the classroom into learning areas, creating a child-sized environment, and designing a setting which is safe, supportive to their emotional well-being and challenging to the children’s skills,. Obviously, designers play an imperative role in the effectiveness of a child’s development; more than any other building type, early childhood educational facilities have a profound impact on their users (Day, 1983). The design of the environment should be greatly considered as preschools and childhood development centers are a child’s first formal learning experience and his/her first exposure away from home (Kruse & McGowan, 2004). Thus, designers must focus on creating a space specific to its user—the child. Through new research, schematic diagramming, and simply the consideration of the child in general, it has become important to recognize the evolution of ECE environments. With the changing needs and development of children it is apparent that environmental standards and spatial requirements should adapt to accommodate such changes. Therefore, it would be interesting to compare the National Association for the Education of Young Children (NAEYC) standards against the accreditation standards for Head Start and National Association for Family Child Care (NAFCC) programs as well, along with research that would continue to support redefining the average space required per child. After completing this research, it has also become evident how policy makers, designers, and educators need to redefine the minimum spatial requirement per child as 35 feet is simply not enough space for children to actively learn, move, and play. With the integration of new technology and equipment into ECE programs, more space is required in the classroom to accommodate such changes in the design of ECE environments. Over the last hundred years, designers have made great strides in creating a physical space successful in fostering early childhood development and learning. With new ingenuity in technology and equipment, the development of various teaching techniques and continued research in ECE environments, designers must continue to evaluate, integrate, and adapt to the changing needs of ECE children. Brewer, J. (2001). Early childhood education: Preschool through primary grades. (4th ed.) Boston: Allyn and Bacon. Building Management, The Department of Administrative and Information Services/Corporate Services, and The Department of Education, Training and Employment. (2007). Facilities design standards and guidelines for DETE children’s service centers. South Australia: The Government of South Australia. Council of Educational Facility Planners, International. (2006). Learning to learn: Pre-kindergarten-kindergarten design implications. Scottsdale, AZ: Johnson, K.
Crawford, B. M. (2001). The common sense early-childhood classroom: A practical guide to caring for preschool children. Torrance, California: Fearon Teacher Aids. Day, D. E. (1983). Early childhood education: A human ecological approach (T.W. Hipple, Ed.). Glenview, Illinois: Scott, Foresman and Company. Exelby, B., & Isbell, R. (2001). Early learning environments that work. Beltsville, Maryland: Gryphon House, Inc.
Grisham-Brown, J., Hemmeter, M. L., & Pretti-Frontczak, K. (2005). Blended practices for teaching young children in inclusive settings. Baltimore: Paul H. Brookes Publishing Co.
Kowalski, T. J. (1989). Planning and managing school facilities. New York: Praeger. Kruse, K., & McGowan, M., (Eds.). (2004). Interior graphic standards: Student edition. Hoboken, New Jersey: John Wiley & Sons, Inc.
Local Initiatives Support Corporation: Community Investment Collaborative for Kids. (2005). Equipping and furnishing early childhood facilities: Resource guide 3. New York: Pardee, M.
Morrow, L., & Rand, M. (1991). Promoting literacy during play by designing early childhood classroom environments. The Reading Teacher, 44, 396-403. Munro, J. H., & Paciorek, K. M., (Eds.). (2004). Annual editions: Early childhood education. (24th ed.) Guilford, Connecticut: McGraw-Hill/Dushkin. National Association for the Education of Young Children. (2007). NAEYC Accreditation Criteria for Physical Environment Standard. Retrieved March 11, 2008, from the NAEYC Accreditation Web site: http://www.naeyc.org/academy/standards/stadard9.asp. National Clearinghouse for Educational Facility Planners, International. (2000). Early childhood centers. Washington, D.C.: Butin, D.
Olds, A. R. (2001). Child care design guide. New York: McGraw Hill Book Company. Ruth, L.C. (2000). Design standards for children’s environments. Portland, Oregon: McGraw Hill Book Company. Vaughan, E. L. National Institute for Building Sciences. (2007). Elementary school. Retrieved August 27, 2007, from the Whole Building Design Guide Web site: http://www.wbdg.org/design/elementary.php. White, R. (2004). Adults are from earth; Children are from the moon: Designing for children: A complex challenge. Retrieved August 27, 2007, from http://www.whitehutchison.com/children/articles/earthmoon.shtml.